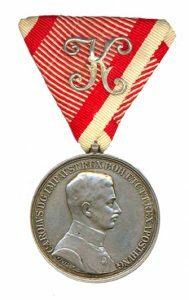 In this blog I am going to commence a discussion of the Bravery Medal (Tapferkeitsmedaille) as issued to officers in 1917 with the image of Emperor Karl on the obverse. In the next blog I publish I will complete my discussion of this decoration. The Bravery Medal as a decoration had existed since it was first established by Joseph II in 1789. The first decorations issued specifically for bravery were called Honor Decorations (Ehrenzeichen) until 1809 when the next decoration in the series was re-named as the Bravery Medal (Tapferkeitsmedaille). In addition to the medal issued in 1789 versions of this medal designated as Honor Medals were issued in 1792 by Franz II and 1804 by Franz I. Versions designated as Bravery Medals were issued prior to 1866 and in 1809 by Franz I and in 1839 by Ferdinand I. In 1849 when Franz Joseph came to the throne he modified the bravery medal to assure that it was consistent with the other awards that bore his image during this phase of his reign. He further modified the bravery medal in 1859 and would again in 1866 and for a final time in 1915. 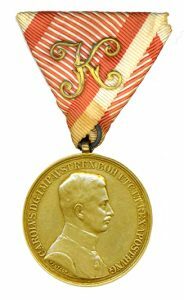 In this blog I am going to discuss the officer bravery medal as issued from 1917-1922 during Emperor and King Karl’s reign. In the next blog I will discuss Part II of the description of this decoration, which was the last type of this historic award which had been issued from 1789-1922. Reason Issued: All medals were issued to reward significant acts of bravery by officers in the face of an armed enemy. As a rule, this decoration was only awarded to those officers, who had already been recognized with the award of other significant Austrian military awards, but could not meet the strict requirements of the Military Maria Theresia Order’s statutes. On June 5, 1849 the Emperor Franz Joseph I declared that all grades of the bravery medal could be worn at the same time. These medals were awarded for acts of heroism that would also entitle the recipient to the Military Merit Cross third class with war decoration and swords. It is reported that officers preferred to receive this medal rather than the merit cross. From 1789 to 1918 there were 30 different versions of the bravery medal. This was the 29th and 30th version of the medal (last version). Obverse: A bust of the Emperor Karl facing right in a marshals uniform with the Order of the Golden Fleece and the grand cordon of the Order of Maria Theresia. Above the bust is inscribed: CAROLVS D.G .IMP AVST.REX BOH. ETC ET REX APOST HVNG. Below the shoulder of the bust of the emperor is the designer’s name KAUTSCH (Heinrich Kautsch). For some privately manufactured gold medals the name is Petzl (F. Petzl). Reverse: A Laurel Wreath tied at the bottom with a flying ribbon, the bottom of which rests on a group of four crossed flags and two standards with zig-zag lines to indicate the colors black, yellow, red, white, and green. Partially hidden by the leaves of the wreath there appears on the right foremost flag, half of the Austrian, and on the corresponding flag on the left, half the Hungarian large coat of arms of the Dual Monarchy. 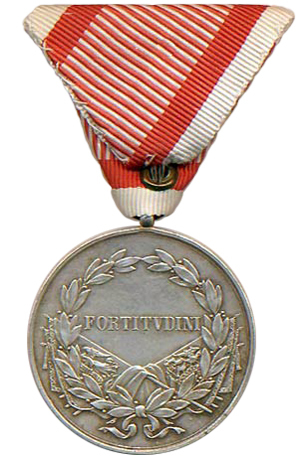 In the field in the center of the medal is “FORTITVDINI” (Bravery). Silver Bravery Medal = 40 mm in diameter. Type II Gold Medal: As described above except in bronze gilt. Type II Silver Medal: A medal the same as Type I except it is bronze gilt.